Discussion in 'MOC 2019 Challenges' started by bcgal00, Jan 15, 2019. Welcome to my technique challenge for Day 15! For this challenge, you will be using a brush to create digital painted edges for paper/elements. Paint the edges of at least 1 product on your layout. This could be your background paper, paper layers or elements (i.e. 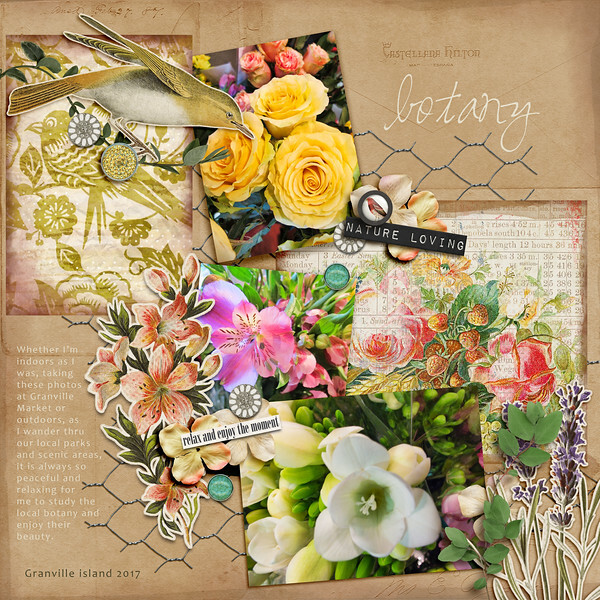 tag, journal card, label). Your brush work should be visible and prominent. Watercolor brushes and textured brushes are great tools for painting edges but any brush will work. I like to use a soft edged brush as opposed to a hard edged brush, personally. Reduce the opacity of the brush as this can create a build-up of color as you move the brush back and forth over the edge, experiment with opacity but generally 15-50% works well. Here is my layout with painted edges. Before you start inking, create a blank layer above the layer of what you will be brushing the painted edge on. To get started, select a brush and reduce the opacity (15-50% as a guideline), then click on the foreground color box (see image below) and select a color to paint with. The two layers will be clipped together when you finish inking. This ensures that the inking is only applied to the product you chose to ink, not anywhere else on your layout. (You can ink directly onto the product layer if you wish without creating the top layer but I recommend working on the blank layer for stamping, as this allows you to alter or delete the paint layer without altering your product layer). In Photoshop, with your cursor, hover between the paint/ink layer and the product layer, while holding down the ALT key and then click to clip the two layers together. An alternate way to clip the layers together is to go to LAYER in the menu bar, choose CREATE CLIPPING MASK. The orange highlights show the brush layers clipped to the paper/element layers. Here is my LO with and without the painted edges. With a busy layout such as this, your eye wanders all over the page, but with the painted edges it helps to direct your eye across the page, making it easier to "see" what's on the page. Changing the color or enlarging/reducing the brush size as you swipe around the edges can add another layer of dimension to the inking. Try adding a thin stroke of color along the edge and then go back over that area again with a larger soft brush and build the ink up as you swipe. Also, try selecting a slightly lighter or darker brush color for further variation in the paint/ink build up on the edges. An optional brush step that can create interesting inking patterns but is not necessary in the inking process, is to change the jitter size and/or spacing of a brush which will rotate the brush each time it is applied. Experiment with slider amounts but I find that generally size jitter of 20-50% works well and angle jitter I tend to keep on the low end of the slider amount. But each brush is different, so play around with it and see what effects you can get. 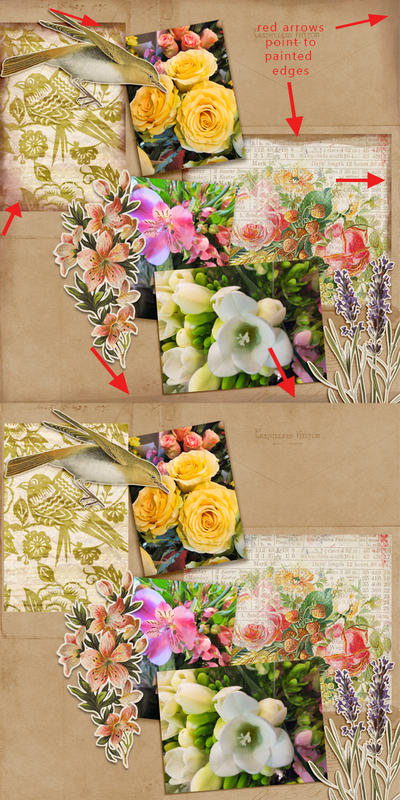 Here is a video tutorial on how to paint the edges of your paper in Photoshop Elements. Paint the edges of at least 1 product on your layout. Make sure that the paint/inking you brush is visible and prominent on your page. jesskab, umyesh, berniek and 6 others like this. Updates and clarifications to my challenge will be posted here as necessary. HERE ARE SOME INSTRUCTIONS GENEROUSLY SHARED BY SOME OF OUR MEMBERS. THANK YOU ALL FOR HELPING EACH OTHER! Any brush will do, a soft edged round brush (this is usually the default kind of brush most often used in photoshop and I think other programs too) but a hard edged brush works too, it just creates a different look. A textured brush, a watercolor brush, stroke brushes, splatter brushes, etc........try different brushes and see what kind of effect you get. Try stamping down onto the page (a single tap of the brush onto the page) and then try swiping it across or back and forth to see what that does. Also, I find that most times I reduce the opacity to help build up the color and create more texture with the uneven stamping. 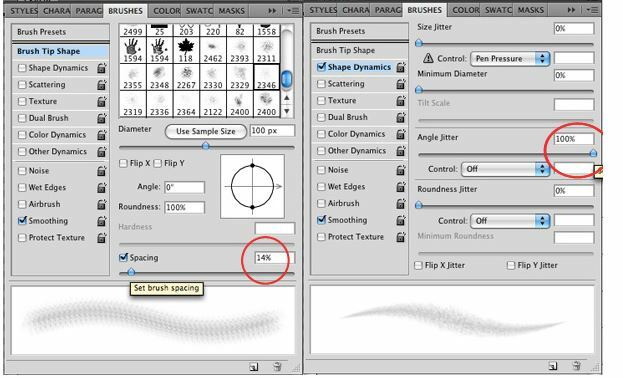 Try changing the size of the brush and if your program allows customization, try changing the angle, jitter, etc to see what that does. we don't have clipping to layers in Craft Artist - elements etc are not each on a separate layer like in PS etc. This technique can be done, but it's going to be a bit more complicated. select all the paint strokes and group them together. Select the paint strokes group and the top item - right click and choose crop. Go to the Touchup tab on the Toolbar. From there choose either the Lighten or Darken option. The other options can also be fun as well, but Lighten and Darken are the best place to start. On the right of your screen you'll need to choose the amount, pattern, diameter and opacity that you'd like, then start playing around! I find it's best to start with the Amount set at 1 and use the most diffused/soft pattern (the option to the right). Go to your Format Photos tab. Click on the Touchup icon (located in first box on the left side of the ribbon). An image editor will pop up onto your screen. Choose to Lighten or Darken. From there you have two choices: Brush Size and Brush Pressure. You can also add or change your color using the different options. Have fun playing around with the different settings to see what you can do. Let me know if you have any other questions! This is also a great way to add extra dimension and shadowing to elements that otherwise aren't there, such as darkening the edge of an element to make it look like it's wrapped or bending around something, like the ribbon sample below. The ribbon didn't have the dark shading at the top - that's something I added in. It's a fun technique to learn and use. 2. Open "Format Photos" and click on "Touch-up"
3. Select "Paint" and choose color. Change brush size and brush pressure". 4. Then, start brushing the edges. Change size and pressure as needed. I found some videos for PSE and Craft Artist that might be helpful for those that want to know about loading/selecting brushes. Hope these help. OOOH! I love this challenge! I used to love inking the edges of my paper layouts - can't wait to play! Genniejoy and bcgal00 like this. bestcee and cfile like this. Wonderful challenge, Rae! I have been wanting to learn how to do this. bcgal00 and tracymonica like this. I am a complete and totally newbie to this as well! I've been playing with it a little bit. It takes some time to get the feel for it and understand the rhythm of the brush strokes. Take your time with this and just play with it. Don't be in a hurry to finish it! bcgal00, lmccandless, cfile and 3 others like this. @Cherylndesigns Have you done this before? Good to know I am not the only newbie You are right I just have to give it a go, take my time and somehow paint with a mouse! I think it will take some time to learn to control my brush with a mouse. cfile and Cherylndesigns like this. No I haven't. It's funny because I was just watching that lady in the video when she was doing another technique and the edge painting was up next. I had to go to bed, but intended to go back and watch it, but just haven't had time. I'm excited to learn this. I've been playing around for the last few minutes and I totally understand that it takes practice, plus a "feel". It's kind of hard to control, but I know if I experiment, it will be a great tool to have! Like Julie said, you can't be in a hurry. I found that out. Thanks for the video, it made it very easy. Cool challenge. marijke, bcgal00 and KellyM like this. *gina* Love to leave gallery love! marijke, ashleywb, FarrahJobling and 5 others like this. This will be fun and very do-able. Woo! Do we have to create our own paint or can we use a layer from a template and recolour it? crazsquaw and bcgal00 like this. Another one I didn't find particularly easy - don't often use the brush tool - still I learnt something - always a bonus. marijke, bcgal00, RJMJ and 3 others like this. tracymonica and bcgal00 like this. bcgal00, threadjungle and cfile like this. WOOO HOOO!!! Right up my alley!!! I love brushing the edges of my layouts!! It gives such a nice finishing touch. Trish, bcgal00, AJK and 1 other person like this. Love this. Haven't done in a long while but was my go to technique when I was a paper scrapper.